Founded in 1938 as Avondale Marine Ways, Inc., Avondale Shipyard has long been a centerpiece of the economy of New Orleans and much of Southeast Louisiana. From barges, to Navy warships, to the oil and natural gas industry, Avondale has been a leader in diverse, industrial manufacturing. The social and economic significance of Avondale goes well beyond the number of individuals who have been employed there. 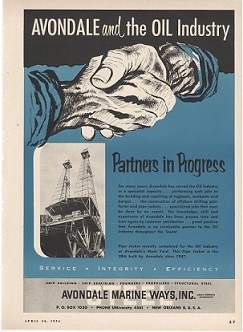 Avondale's unique position on the Mississippi River helped the diversified manufacturing operation to become a leader in the oil and natural gas industry as well as the shipbuilding industry. 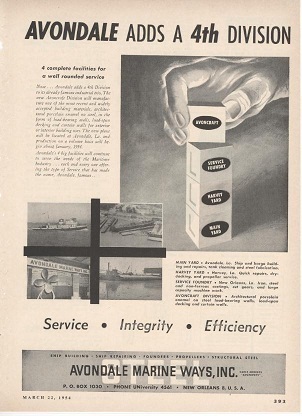 Featured here are advertisements for Avondale Marine Ways, Inc. dating from the mid 1950s to the early 1960s. During that time, Avondale was comprised of four divisions: the Main Yard, the Service Foundry, the Harvey "Quick Repair" Yard, and Avoncraft. Each division specialized in different areas. The Main Yard's focus was on ship, barge, tug, and large equipment manufacturing. The Service Foundry fabricated the steel pieces necessary for ship and equipment manufacture. The "Quick Repair" Yard located on the Harvey Canal repaired ships ranging from barges to large cargo ships. 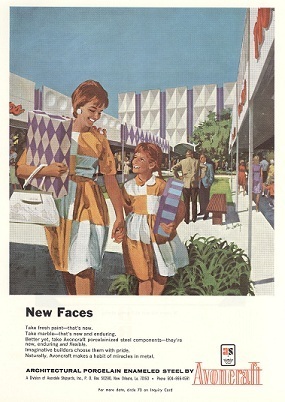 Avoncraft produced porcelain enamel and "porcelainized" steel fabrication; both were used in constructing facades and even pre-fabricated service stations. 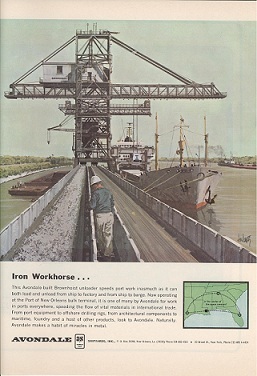 Andrew Brooks, Michael Mizell-Nelson, “Avondale Marine Ways, Inc. ,” New Orleans Historical, accessed April 24, 2019, https://neworleanshistorical.org/items/show/210.